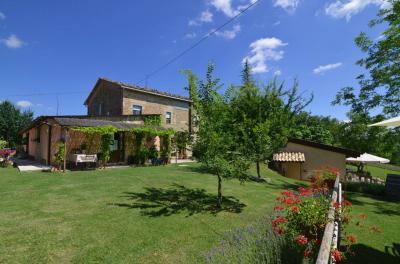 In the Marche countryside, between The towns of Cossignano and Montalto delle Marche, farmhouse for Sale of about 225 sqm which was completely rebuilt with three-hectares farmland. The property is located at the end of a small private road and the house is placed in the middle of the ground where you can admire an unbelievable view. A truly lovely and quiet location. The house was completely rebuilt on 2013 based on anti seismic regulations and with great attention to energy standard saving. The entire design of the house was influenced by Feng Shui rules considering the carhacteristic of the landscape, colors and interior spaces of the house. From the main entrance you can immediately enjoy a very huge living area with large South-facing windows, an open kitchen with small pantry, a half bath and closet. From the living room you can access directly to a wonderful porch of approximately 45 sqm where you can stay, dine or just relax in front of an excellent view of the surrounding vineyards. The ground floor also has a separate area suitable for guests with kitchen, bedroom, bathroom and lovely pergola with bamboo. On the first floor there are three bedrooms, two bathrooms, a sitting area with access to a large panoramic terrace of about 45 sqm. The house has details and quality relevant including: controlled housing ventilation system, solar panels, PVC Windows with aluminum shutters, wood burning stove and electric kitchens (no gas). The property has more than three hectares of farmland surrounding the building with many olive trees and a small vineyard, and large flat area for the construction of a swimming pool. 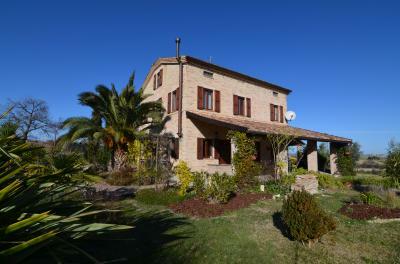 Great solution for living the Marche Region surrounding by the Nature at few km from the Adriatic Sea.